Last week I attended the NAB Show (National Association of Broadcasters) in Las Vegas and Internet advertising conference ad:tech in San Francisco. More on NAB below. Quick take… big crowds around the digital production systems vendor’s booths and a lot of space in the aisles elsewhere. Zero length cab lines were a telling sign. Creative is the new content. Or was it content is the new creative? Or was it consumer generated social media (or is it "earned media?") are the new content and creative? I do acknowledge and celebrate the power of the Internet and digital technology in enabling an astonishing transformative impact on society, let alone content, commerce and advertising business models. The growth and impacts absolutely will continue. But… despite the world view one sees from San Francisco (where I reside), Manhattan or certain portions of LA – the Internet is not "everything." Especially as it relates to advertising. Let’s take a look at the mix of advertising spend in the US in 2008. The below chart combines ad spend estimates for non-Net segments from Robert Coen of Magna Global (as of December 2008), estimates for the Internet from the IAB/PWC and an estimate for local cable spending from the NCTA (plus my estimate for satellite/telco local avail spot). 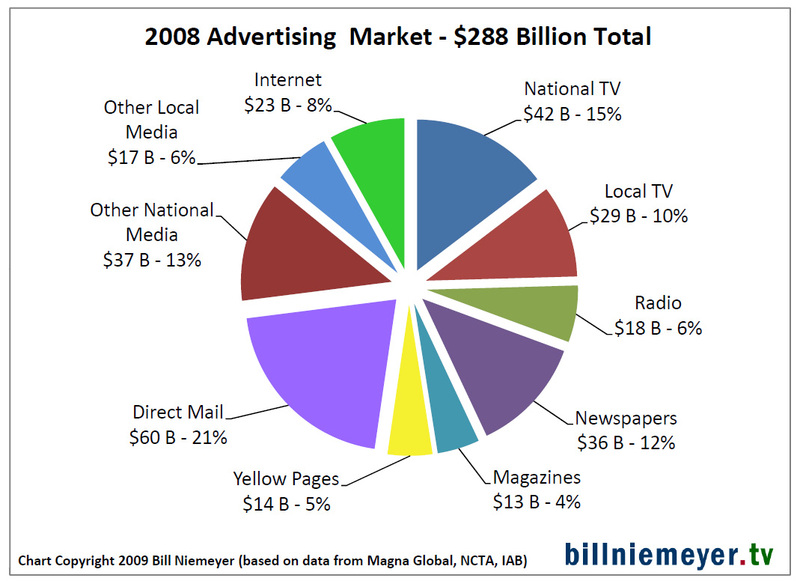 While this is a bit of reality, it should be good news for the Internet (and advanced advertising on TV platforms too) – there’s a lot of advertising dollars to migrate from other platforms – Direct Mail dollars for example, by enhancing addressability. As to cord cutting… despite the anecdotal stories that many are abandoning traditional TV services in favor of broadband delivered video, the evidence just doesn’t support this. I cover this in detail in my recent newsletter issue "Indexing Cord Cut-ability – How Much TV Do You Lose Going Online-Only?". In fact, the evidence supports increasing consumption of traditional TV. Twitter – "It’s the digital Macarena" - Joel McHale, host of E!’s "The Soup." Again, I celebrate the current status and transformative possibilities of the Internet and digital technology. And, traditional media needs to recognize the changes that are taking place lest they proceed down the music and newspaper arcs (frankly, it seems to me the need to respond to digital tech is pretty well recognized now among "old media"). TV platforms need to become more "Net like" in using digital tech to provide better experiences for viewers and advanced advertising for marketers. But online and new digital media also needs to recognize its current role in the media mix for both consumers and advertisers – the Internet is not a "one size fits all" for either. Internet content providers and social platforms need to integrate with overall media distribution and marketing plans. From the panels at ad:tech, it was clear there are clever Internet participants who are avoiding this "digital tunnel vision" and looking to integrate, as well as adapting best practices from other mediums. Other Internet participants are keeping the blinders on, providing me an opportunity to be a curmudgeon (and for that I thank them). Attendance – as reported by Broadcasting and Cable – 83,000, down 20% from 2008. That’s the official NAB number, it felt lower than that. Two indications of this – end of day cab lines were non-existent – rooms in the swanky hotels were going for less than no-tell motels in years past. It was a tale of two shows. The South Hall was crowded – where the booths of high-end digital video production vendors were (including Avid (back after missing 2008), Adobe, Autodesk – Apple was again MIA). The Central and North Halls – TV and radio station vendors mostly – not very many people. The production of TV and feature films is leveraging digital technology to a remarkable degree. 100% digital, using robust networks and server farms feeding video and audio content to sophisticated editing systems with innovative user interfaces. Granular metadata standards support exchange and manipulation by disparate systems to ultimately produce a single piece of high quality content. Then… when this content is finally delivered to TV viewers, this sophistication and metadata granularity seems to be stripped away, at least with respect to consumer search and discovery, and for advancing the state of the art of advertising.